I am super impressed when I see handbuilt work that is so symmetrical and perfect that it looks wheel thrown or slip cast, especially when no molds or forms were used in the handbuilding process. So I was blown away when I saw today’s video (which was filmed and submitted by potter Stephen Robison). 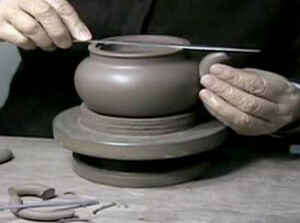 In the video, Zhou Gui Zhen, who has been designated a National Living Treasure in China, demonstrates the construction of the body of a teapot from slabs using a traditional Yixing technique. Yixing (pronounced “yee shing”) is a pottery center near Shanghai, China. The term also refers to the reddish brown stoneware teapots that have been made there since the 16th century. Yixing teapots are traditionally made from free-formed slabs, as Zhou demonstrates, or with press-molded pieces. Zhou’s craftsmanship is truly poetry in motion. Next week, Zhu Jiang Long will demonstrate how to refine the lid of one of a teapots so that it fits perfectly. He also puts the finishing touches on the knob – Jennifer Harnetty, editor.